Meet your new best friend, Maggie Faris. 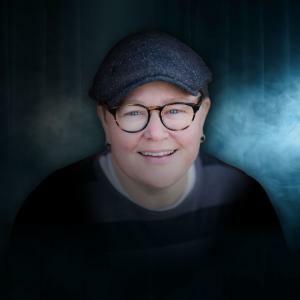 Maggie is noted for her ceaselessly cheerful personality and seemingly endless series of quirky, intelligent jokes dissecting our fears and social barriers. Maggie is a comedy competition assassin. Audiences and judges love her. She won the Minnesota Laugh off. Another competition win made Maggie the Public Address Announcer for the St. Paul Saints professional baseball team, which led to an appearance on ESPN™s Cold Pizza for her unique style and memorable announcements. She beat out Tig Notaro to win both the Funniest Clip of the Year and the Silver Nail award at the Aspen Comedy Festival. Curve magazine named Maggie Faris one of the Funniest Lesbians in America. She recently won The Advocate Magazine’s national search for the Next Funniest Queer Comedian. She was also voted “Best Comedian” by her Minnesota peers. Maggie has also been invited to perform at Bridgetown Comedy Festival, Boston Womens Comedy Festival, Gilda’s Laughfest, Out Loud Comedy festival in San Francisco, Laugh Your Asheville Off, and best of the fest in the 10,000 Laughs Festival and the first Madison Comedy Festival. Maggie has opened for such greats as Jay Pharoah, Michael Che, Maria Bamford, Daniel Tosh, Nick Swarsdon, Josh Wolf, Jamie Kennedy, Kathleen Madigan, Jimmy Pardo, Todd Glass, Louis Black, Joey Diaz, Damon Wayans, and Fortune Feimster.